Thialand: “Tiger Selfies” – A Cruel Trend Driving A Captive Wildlife Industry. 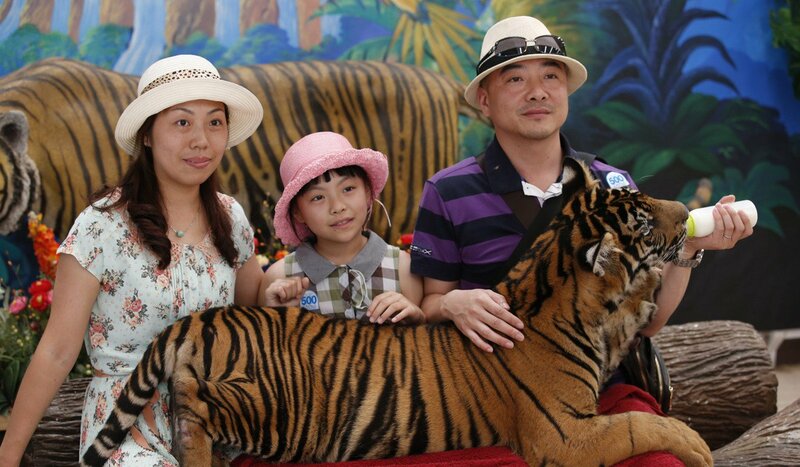 On the shabby outskirts of a seaside resort in Thailand, a Chinese couple in beachwear lean across the back of an adult tiger. The big cat yawns with weary insouciance as two handlers cajole it around its pen and prod it with bamboo sticks. In a smaller enclosure, another couple giggle as they dangle their infant son over a juvenile tiger. Nearby, a tourist in his 20s poses as if in mid roar over two dozing young tigers before – prompted by the handlers – grabbing their tails and putting them up to his mouth, as guffawing friends watch on. This is the disturbing new face of wildlife tourism in Thailand, where tigers are hand-reared to provide social-media images for foreign visitors. 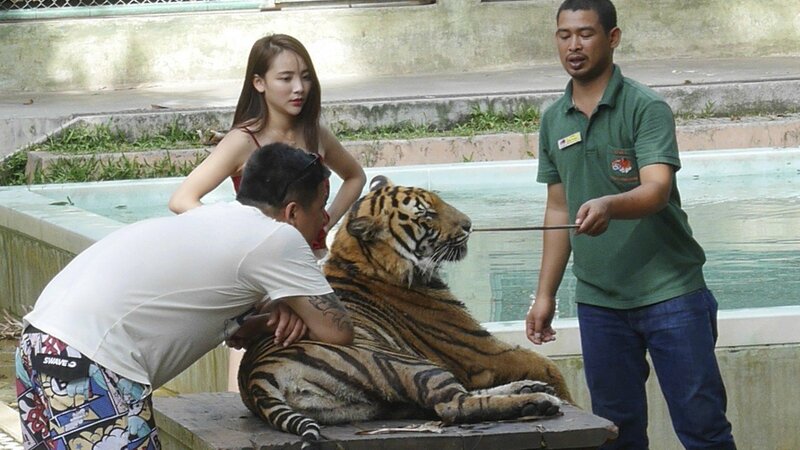 Every day, busloads of tourists are whisked away from their sunloungers to spend an hour or so posing for pictures with unchained, surprisingly docile tigers. By the time they get back to their seaside hotels and settle down for sunset cocktails, many will have already uploaded pictures of themselves with the animals to Facebook and Instagram, to impress – or appal – their friends back home. Tiger Kingdom, in Phuket, is one of more than a dozen “tiger selfie” attractions that have sprung up across the Southeast Asian country in recent years, driven by booming numbers of package-tour arrivals from mainland China and India, and the desire for ever more audacious social-media shots. Along with elephant-riding venues, they provide bite-sized encounters with captive wildlife – albeit at a price. Tiger Kingdom charges 900 baht (HK$220) per person to pose with a small tiger, plus 500 baht should you need an in-house photographer to take pictures, and offers encounters with newborn tigers for 2,500 baht and with a “giant tiger” for 2,000 baht. The attractions appear hugely popular with tourists from across the globe, although TripAdvisor posts suggest it is an experience some regret immediately afterwards. For many others, however, getting up close to a tiger is clearly a highlight of their holiday and the largely positive reviews praising the “awesome experience” and “lifelong memories” of parks such as Tiger Kingdom – which categor­ically denies drugging its tigers – has triggered a campaign by Hong Kong-based Animals Asia Foundation to get TripAdvisor to stop listing the venues. More than 40,000 people have signed a petition by the charity calling on the world’s largest travel website to stop hosting animal attractions featuring elephant rides and tiger selfies, which, they say, promotes “the exploitation of many thousands of wild captive animals in Asia and elsewhere”. For its part, TripAdvisor says that delisting such places would be counterproductive, arguing that tourists who are forewarned are forearmed. Another charity, World Animal Protection, estimates that there are now more than 800 tigers “posing” for selfies in venues across Thailand, and says they endure “a lifetime of suffering starting with early removal from their mothers followed by unrelenting handling and stressful interactions with visitors”. As they grow, the animals are confined to small, barren cages, chained and subjected to harsh training, the charity says in a report. It also estimates that captive tiger numbers grew by more than 200 between 2010 and 2016 because of the booming popularity of big-cat selfies. Somsak says most visitors from China and India come with group tours. 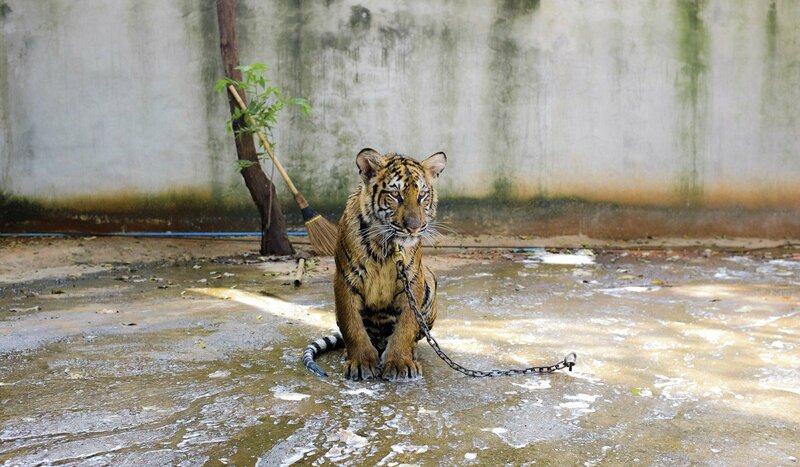 World Animal Protection has launched educational campaigns in China and India, to discourage tourists and tour operators from patronising parks in which captive tigers and elephants are used for entertainment, but Somsak says the scale of the industry surrounding such operations presents a massive challenge. Even seasoned observers such as Somsak struggle to understand why the tigers are so passive when they are hugged and tugged by tourists in the selfie parks. “It’s not natural behaviour,” he says. “Tigers are very strong animals and very active, and don’t usually behave the way you see them behaving in tiger venues. Thailand’s relatively lax animal welfare laws mean there is no mechanism for checking on the health of the animals kept in entertainment venues. “It is the Thai government’s responsibility to oversee the operation of public zoos, including all the tiger parks, but they don’t visit regularly or check on the tigers’ health,” says Somsak. “They only look at licence issues. TripAdvisor introduced an animal-welfare policy in 2016 and stopped selling tickets and issuing “certificates of excellence” to attractions such as Tiger Kingdom, which still proudly displays its 2015 certificate next to the animals’ cages. The travel company has also introduced a paw logo to indicate listings featuring wild animals, with links to expert advice on animal welfare from organisations including World Animal Protection. Somsak believes TripAdvisor – which launched a Chinese site, DaoDao.com, in 2009 and expects China to soon become its biggest market – should go further. “They should issue stronger advice to tourists about the venues,” he says. Animals Asia’s animal welfare director Dave Neale has held talks with senior TripAdvisor officials to make the same case, and to present a petition calling for listings of attractions such as Tiger Kingdom to be removed altogether. He says the online giant is “floundering” on the issue. “TripAdvisor says this should all be self-regulated by the public,” Neale explains. “They say it is better to have them on TripAdvisor with a bad review so people know, but in reality that isn’t working. They are getting very high ratings. They get occasional bad reviews but, generally, the ratings are good because people are ill-informed. Neale describes the craze for tiger selfies as bizarre. “People do seem to leave their common sense behind when they get on a plane sometimes,” he says. “Imagine if someone rocked up in Oxford Street, in London, with a tiger and tried to get people to have their pictures taken with it. No one would go near it. The placid behaviour of the tigers in the parks is “quite amazing”, Neale concedes. “Drugging used to happen a lot and then it got exposed. Whether places are still drugging them and hiding it, I don’t know. A lot of the animals seem fully aware of what’s happening and seem uninterested in the public. I guess it is just due to the fact they hand-rear them. But that doesn’t make it right from the animal’s point of view. “The fact you have to have someone standing around with a stick says a lot. It isn’t giving the animal free choice. It has to be there or be subjected to physical abuse. “Rather than just taking pleasure out of having your photograph taken with the tiger, you should find somewhere they are in a natural setting and watch them being tigers.